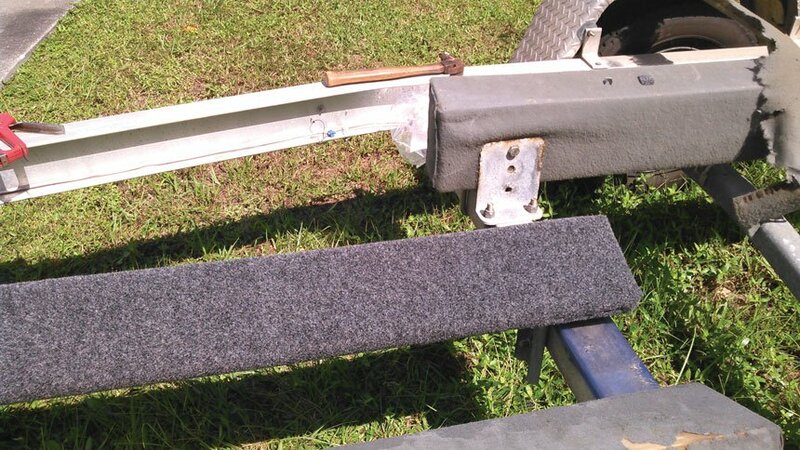 The more frequently you launch a boat from a trailer, the shorter the life of the carpeting. 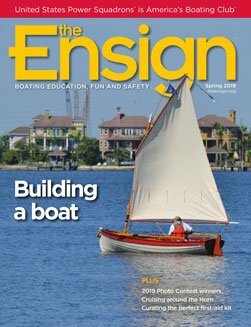 I launch and land my boat two or three times a month between March and October, and the dealer carpeting, which is significantly thinner than aftermarket carpeting, lasted 11 years. Holes worn in the carpeting exposed the wood, which couldn’t provide adequate friction and could allow the boat to shift on the trailer while in transit. To replace the carpeting, first carefully remove the worn carpeting and fasteners holding it on the bunk. If not removed, the fasteners, usually staples, can cut and scratch both you and your gel coat. I’ve seen both steel and stainless steel staples holding carpeting. Regular staples will probably be rusted. Stainless will be bright. Rather than risk finding a staple wire or tack in your tire or the bottom of your foot, place the used staples and tacks into an empty water bottle. After removing the staples or tacks, unfold the carpet on the ends of the bunks carefully so you can use it as a pattern to cut the ends of the new carpeting. Most marine product dealers sell carpeting suitable for trailer bunks in the proper width. I bought mine off the shelf. The wooden members of the bunks are closer in size to the actual measurements, such as 2-by-6 inches, unlike most lumber from the lumberyard. Should you choose to cut your own strips from indoor-outdoor carpeting, account for this by measuring the bunk boards. To do this, measure the width and the thickness of your bunks. Add the width and four times the thickness measurement to determine how wide to cut your strips. For the length, add the length of the bunk and four times the thickness to determine the total length of the strip. If you bought carpeting strips of the proper width for your bunks, the measurement for the length is the bunk length plus four times the bunk thickness. Cut the ends using the pattern you saved from the old carpet. Fasten the carpeting strip to the bunk using stainless steel staples. Available from staple gun manufacturers, stainless staples can be ordered online for your specific staple gun. Although pricey, they are worth it especially if you boat in salt water. Fit each end piece of carpet to the bunk end and fasten it with staples. Fold the carpeting over the edge and staple it every three or four inches on both sides of the bottom of the bunk. Even though this may be obvious, don’t put staples or tacks on the top of the bunk where your hull will slide on and off. That’s it! You’re done and should be good for another 10 years or so.